Sarah Luczaj gave me a very kind review at the Counseling Resource blog. I am grateful to her for the generous review, and I am honored that a working therapist had such nice things to say about my book. You can buy the book (only $2.99, for the Kindle version or a PDF) by following the link on the sidebar. 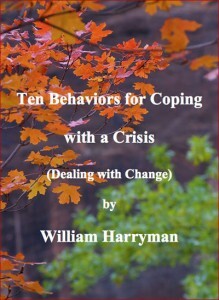 As good as his word, William Harryman delivers ten ways to respond to a crisis, which he sees as arising from getting “stuck in the process of change”, somewhere between who we were before the crisis happened and who we are afterwards. I have been an avid reader of one of Harryman’s blogs, Integral Options Cafe, for a couple of years now. What I enjoy so much in the blog is amply present in this, his first e-book: clearly presented spiritual and psychological wisdom, a synergy of integral and Buddhist philosophy and practice, along with scientific research and cultural and political perspectives, all crackling with intelligence and awareness. When my father died I was thirteen years old and there was no one around to teach me how to mourn properly. The pain moved through my body very quickly, but after a few minutes I shut it down, not knowing how to be with that level of grief. Because I shut it off and did not let it move through me as it might have otherwise, I suffered for many years with anger and depression, both of which became a filter through which I viewed the world. Letting the pain and emotions move through is easier said than done. It is hard to trust that you really do have all the resources you need to get through the situation, and not fall into depression and helplessness. It can be helpful to develop a certain distance to prevent yourself from being overwhelmed, a place from which to observe what is going on inside you. Chapter two explains the growth of an “Observer Self”, a part of us which can step back, see what is going on inside us and place it within a larger story. It allows us to stop identifying with the painful feelings as “me” and “relate to our pain, our fear, our anger [...] not relate from it.” A guided exercise, adapted from Wilber and from Assiologi (the founder of Psychosynthesis) leads us through the process of recognising, and experiencing, that “I have a body, but I am not my body; I have feelings, but I am not my feelings; I have desires, but I am not my desires; I have thoughts, but I am not my thoughts”. This leaves us with a spacious feeling of freedom and awareness.